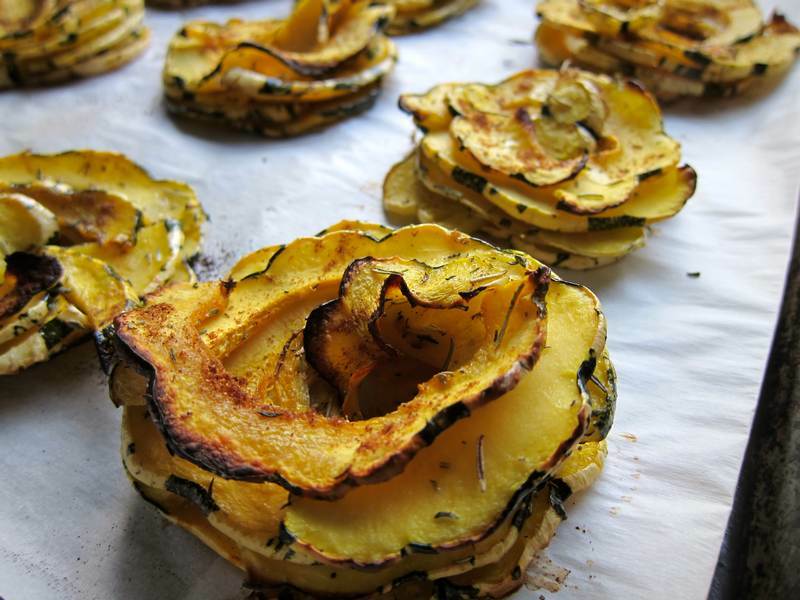 Delicata Squash Stacks – A Thanksgiving Delight! Happy Thanksgiving to all Jittery Cook readers! Wishing you great celebrations and many things to be thankful for, now and forever. One of the things I’m thankful for is having all of you in my extended circle. Couldn’t wait to share this little gem of a recipe that would enhance whatever Thanksgiving holiday celebrations you have in mind. Preheat the oven to 400F. 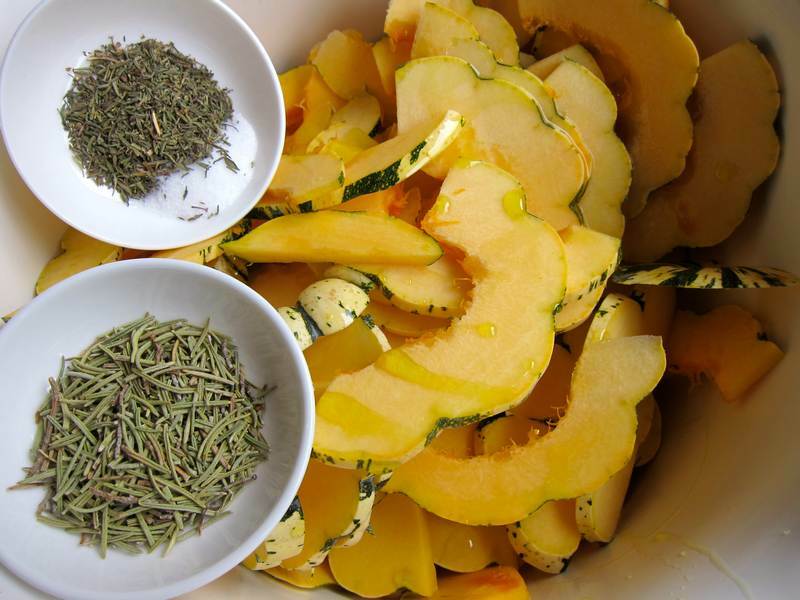 Combine the squash, olive oil and herbs in a large bowl, mixing well with your hands. Sprinkle on a little salt and pepper, then toss again. Stack the squash in triangular or stair shaped mounds. Sprinkle with a little paprika. Roast for 45-50 minutes until the edges brown and the flesh is very tender. Sprinkle on a little more sea salt as required. Serves 6. 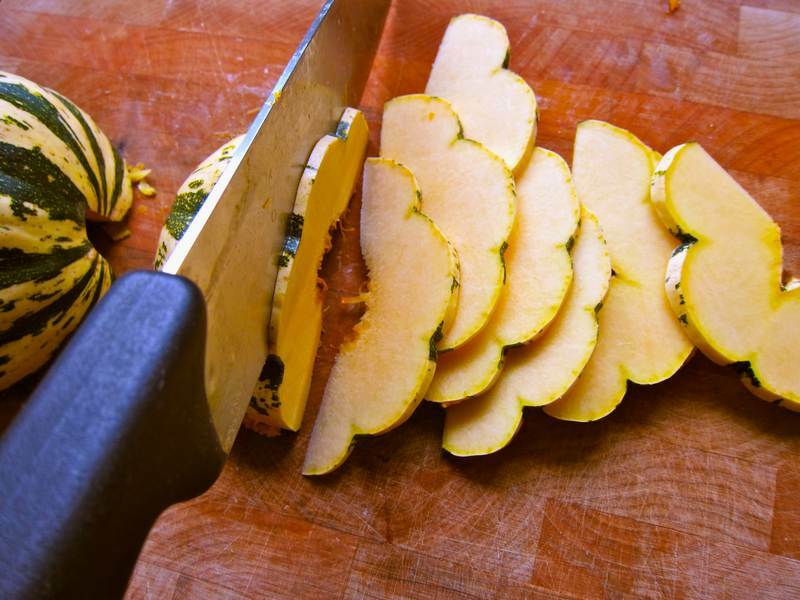 You can substitute 4 large potatoes, sweet potatoes or a combination of the two for the squash. This recipe is inspired by Nick Nairn‘s New Scottish Cookery, a fresh innovative approach to cooking with the finest Scottish ingredients. He makes the potato version. Thanks to my sister Julia for insisting that I try this recipe, and to Laura and her mom Allison Richardson for bringing a little Scotland into our lives. That is a beautiful looking squash and thank you for the link to my post. You are very welcome. I am enjoying all the meeting and greeting! Your instructions for the delicata squash left out the olive oil. I assume it’s tossed in with the herbs. Looks beautiful and delicious! I have butternut squash in the house. I never heard of delicata squash. Is it available anywhere. Anyhow this recipe sounds and looks delicious. I say try the recipe with butternut squash. Should be perfect. I had never heard of delicata squash before either. I bought the squash at Loblaws, and I’ve seen it at Atwater Market. I loved the shape and colour as decoration and was curious to sample the flavour. Great to hear from you Dorothy! You don’t peel the squash ? No. Skin looks lovely and it’s 100% edible. Even tasty, like potato skin. 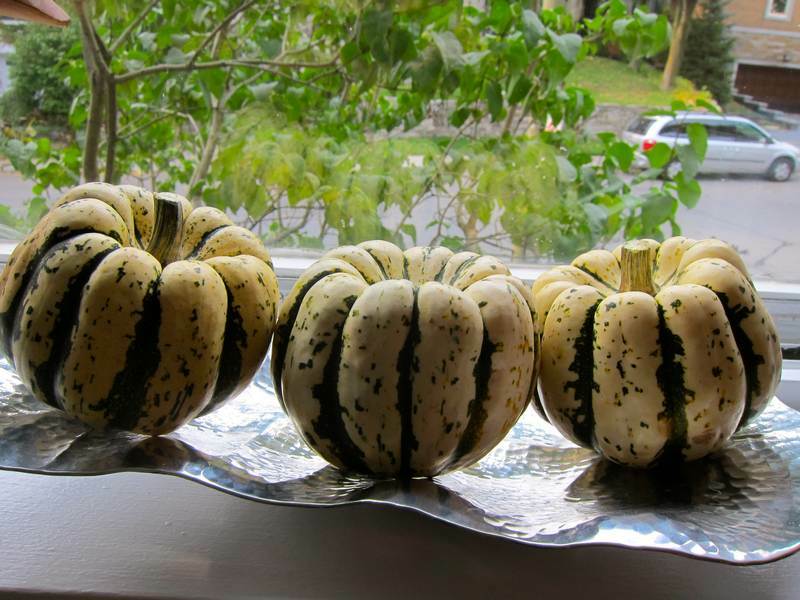 I LOVE delicata squash, and am always looking for new ways to cook it. This looks awesome! Thanks for the idea! Thanks Sarah. They are like edible, roasted flowers. Hard not to eat right off the pan. Such a visually appealing way to serve squash! These are perfect for Thanksgiving or even just a regular dinner party. Thanks Jennifer! The original recipe calls for potatoes. I’ve tried them and they are irresistible. I love how the scalloped edges of the squash make the stacks look like large flowers. Oooh, I love this idea! Simple, yet fancy at the same time. I cannot wait for winter squash season – delicata is one of my faves of the lot. Thanks Jon. That was quite a party! Fun to mingle online. These are gorgeous!! I think they would make a nice addition to a fall dinner party! Love that you paired rosemary with these. Thanks Louisa! Am putting rosemary into so many dishes lately. Love the flavour. Yummy! like it, i will buy it from farmer’s market this weekend and make it.thank you for sharing! Thanks for the encouragement Kavita! Nice to know that older blogs can still be appreciated! I found you through FBC. Thanks for your comment on my blog! Those stacks would look lovely on the plate. I also like squash recipes where the ingredient shines, not like some of those squash mashes that end up hiding the flavour. Good point! Squash that shines. You definitely have a way with words!